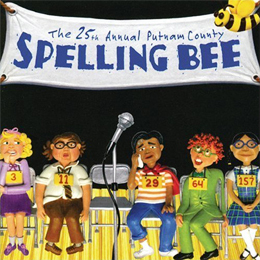 Spelling Bee holds its own, laugh for laugh, with any of them. Plenty of credit goes to Mr. Lapine, who keeps some kind of order over all the silliness; it also belongs to the actors who play the grownups. As hostess and past champion Rona Lisa Peretti and troubled vice principal Panch, Lisa Howard and Jay Reiss are not just funny themselves, but the cause of fun in others. As each audience volunteer in turn encounters a carefully tailored putdown, I again found myself wondering: Are they making this up as they go? They don’t get to sweat the syllables in words like ‘weltanschauung,’ but Lisa Howard and Jay Reiss provide a fair portion of the comic zest in The 25th Annual Putnam County Spelling Bee… Ms. Howard brings a tart blend of geniality and officiousness to the role of Rona Lisa Peretti, the hostess at the county meet, who has fond memories of her own glory days as a spelling champ. Presiding over the competition, with a cheerfulness as sturdy as her shellacked coiffure, is Ms. Rona Lisa Peretti, herself a former champ, played with implacable perkiness by Lisa Howard. Lisa Howard has all the pride of a former pageant winner. Also excellent is Lisa Howard as Rona Lisa Peretti, the Bee’s hostess and one-time champion. With a dry wit perfectly suited to the color commentary she provides (and her ad-libs for audience volunteer spellers are often as funny as Sheinkin’s scripted barbs), she also provides a vital, sweet-natured connecting bridge between childhood and adulthood. More than anyone else, she seems best in tune with both the immature anxieties of her young charges and the world-weary rumblings of her adult coworkers.